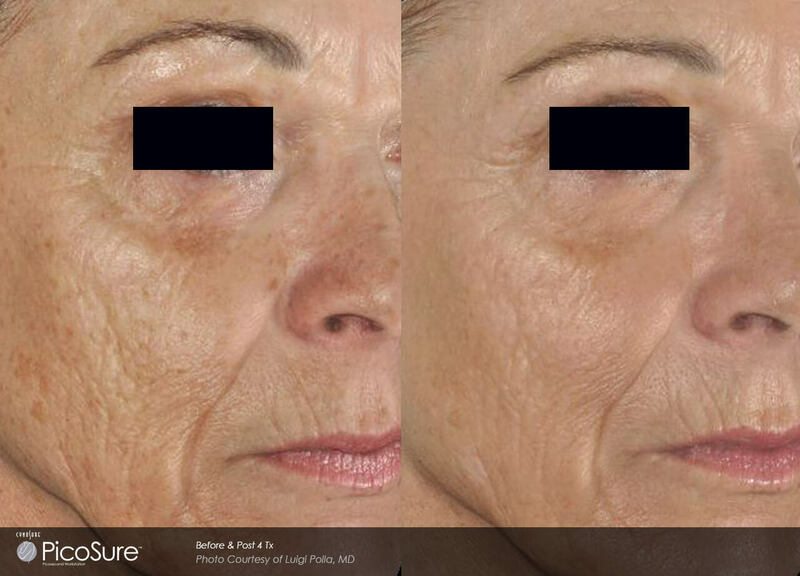 With the latest technology in laser skin revitalization by PicoSure®, we take advantage of your body’s natural ability to help refresh your skin, restoring and enhancing youthful look and feel. 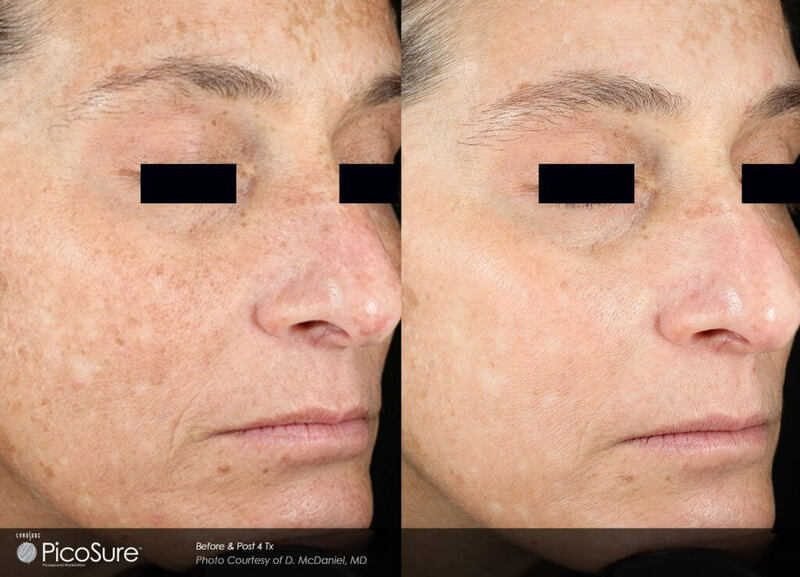 Ideal for treating acne scars, pigment lesions, tattoos, and wrinkles, discover the PicoSure® difference at SKINS Derma Care today. 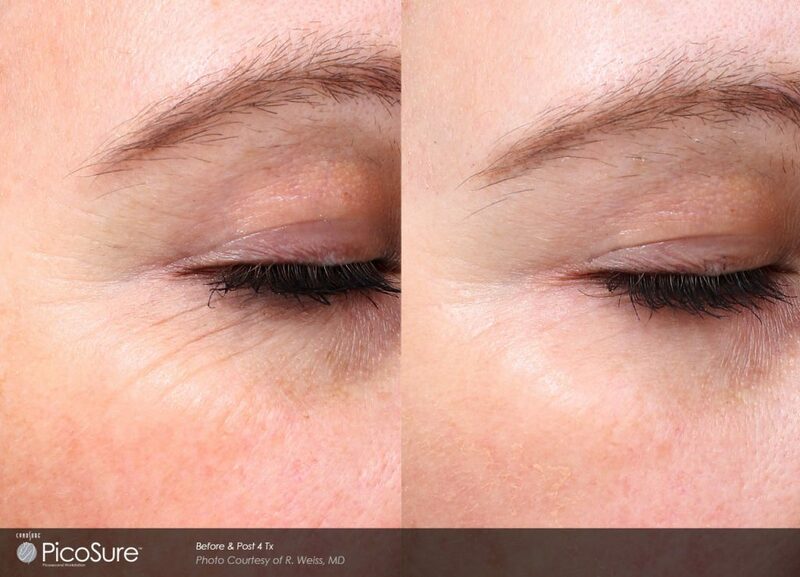 Using innovative Skin Cell Activation technology, our PicoSure® laser promises results like you’ve never seen before. 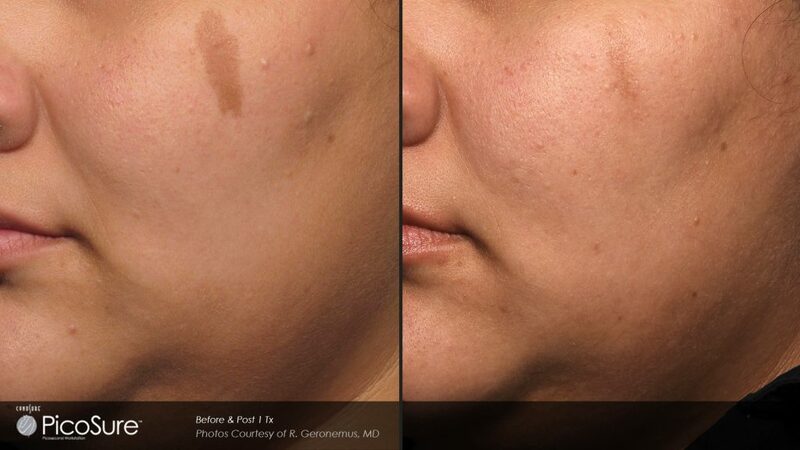 This gentle, no-downtime treatment is an excellent alternative to intense surgical procedures. 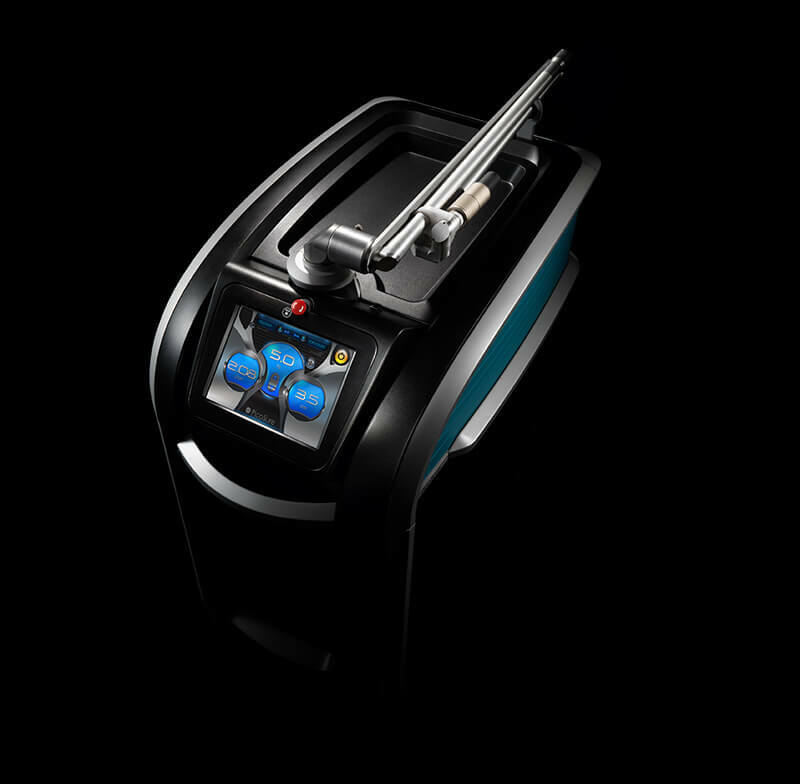 This brand-new technology allows you to effectively rejuvenate the targeted treatment area in no time. With nanosecond laser technology, treatment relies on photothermal action resulting in more damage done to the surrounding area. This photothermal action delivers heat to the targeted pigment and surrounding tissues. With the picosecond laser, downtime and damage is minimized with ultra-short, concentrated bursts of energy that are more effective at targeting treatment areas. The number of treatment sessions required to effectively rejuvenate your treatment area depends on the size, depth, and pigmentation of your skin condition. A treatment plan will be established as part of your free, no-obligation consultation with our SKINS Derma Care team of professionals. PicoSure® is the world’s first and only picosecond aesthetic laser platform for multiple aesthetic applications. This breakthrough in laser technology delivers ultra-short pulse bursts of energy to the skin in trillionths of a second to gently target and eliminate pigment without harming the surrounding skin. The short answer? Melanin, which gives our skin its colour. Pigmented lesions are dark in colour because of concentrated melanin in the area in question. By and large, pigmented lesions are caused by sun exposure, though it’s not uncommon for people to have them at birth. Hormonal changes also sometimes cause pigmented lesions to appear. Only a few treatments are needed for most pigmented lesions, but some may need further treatment. Wrinkles, tattoo removal, and more take varying amounts of time depending on the treatment area, patient, and other factors. Patients often describe the laser pulse sensation as feeling like a thin rubber band snapping against their skin. Numbing agents are very rarely needed. What post-treatment care will I need? Keep the area clean and to avoid any irritation. Depending on your treatment, your practitioner may recommend additional treatments and care. 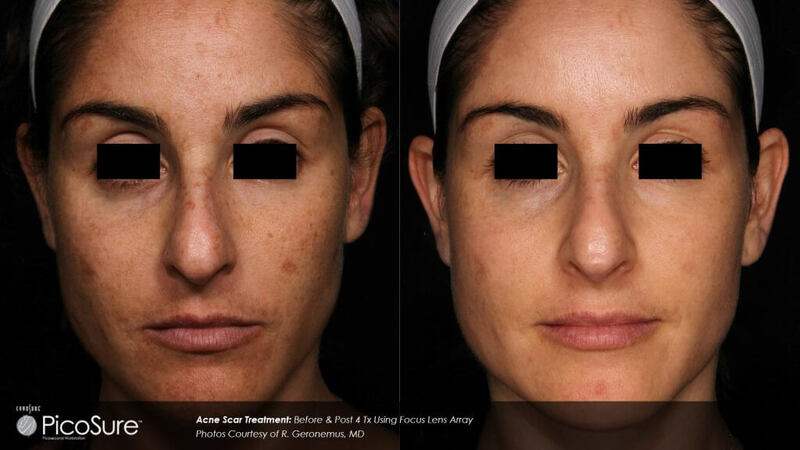 Laser acne scar treatment works on many skin types and tones. The best way to find out if you’re a good candidate is to discuss your options during a consultation at SKINS Derma Care! How long does treatment take? When can I expect results? 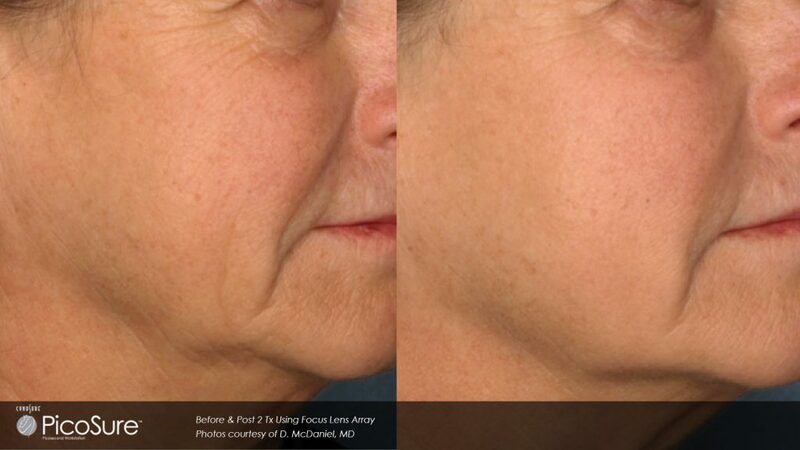 The treatment can be performed in as little as 15 minutes or less, depending on the targeted area. Acne scars begin to improve in as little as 2 treatments, but a series of 3 to 5 treatments are recommended for optimal results. Is there any downtime for recovery? Some patients report temporary redness and swelling at the treatment site. Typically, unwanted pigmentation may slightly frost (whiten) during treatment, then darken over the following 24 hours before shedding over time.